Text: ‘Emil. Carlsen. 1903 -‘. 1903 Emil Carlsen [1848-1932], the artist . 2018 Sotheby’s [1744- ], New York, NY, “American art”, May 23. 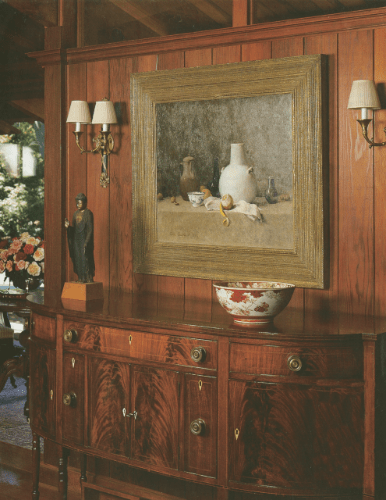 – Sotheby’s [1744- ], New York, NY, online auction catalog, “American art : property from the collection of Willard and Elizabeth Clark”, May 23, 2018, lot #35, illustrated : color. – Emil Carlsen : conscious painting by William Eric Indursky, Emil Carlsen Archives, New York, NY, 2017, figure #183, illustrated : color on page 179. – “Soren Emil Carlsen : the Hammershoi of Manhattan” by Kim Lykke Jensen, Narayana Press, Gylling, Denmark, 2008, illustrated: color, page 46, figure 28. – Vance Jordan Fine Art, New York, NY, exhibition catalog, “Selections from the Libby and Bill Clark collection”, October 29 – December 7, 2001, page 16, illustrated plate #3. – The Magazine Antiques, New York, NY, “Living with antiques : a collection where east meets west” by Michael Quick, November, 2001, volume 160, number 5, page 684, illustrated plate VII. – Vance Jordan Fine Art, New York, NY, exhibition catalog, “Quiet magic : the still-life paintings of Emil Carlsen“, October 28 – December 10, 1999, #22. – Antiques, May, [ad for painting by Thomas Colville], 1982, page 1012, illustrated.